Yesterday, November 6th, members of Governor Cuomo’s Common Core Task Force held five simultaneous regional “listening sessions” around the state; five more will follow. The NYC event was held in Long Island City at Laguardia Community College from 4-6 pm on a Friday. Minimal advance notice and inconvenient scheduling no doubt suppressed turnout among NYC parents and teachers. Here are some highlights from yesterday’s event. Task Force members: Assemblywoman Catherine Nolan and Brooklyn 3rd grade teacher Kishayna Hazelwood were the task force members presiding over the NYC session. I thought they asked good questions, particularly of Common Core (CC) supporters and those who thought the testing program simply needs to be tweaked. Nolan — who credited Carol Burris (former Long Island high school principal and now Executive Director of the Network for Public Education Fund) with helping her understand the “sort and rank” function of high-stakes testing as well as how the cut scores have been politically manipulated — asked CC and testing supporters what they thought of those practices. Nolan also asked a lot of questions about how testing should be modified for students who are English language learners and those with disabilities. Attendance and audience: There were probably over 100 people in attendance at the beginning of the session with quite a few people standing in the back. 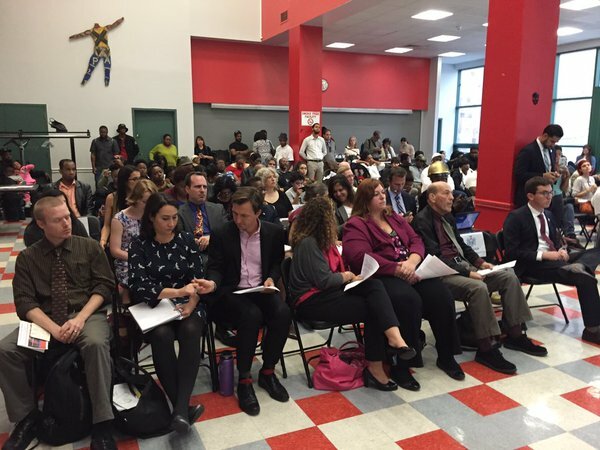 Bizarrely, after just a few people had spoken (all against CC and high-stakes testing, including City Council member Danny Dromm), there was a mass exodus. According to Katie Lapham’s excellent account of the event, those who departed were mostly parents and organizers from Students First NY. One person remarked to Katie, “This isn’t for us. We support Common Core.” But there were others who left fairly early on as well; I’m not sure why. Speakers: About 25 of us spoke — sadly, only 3 spoke as parents. About half the speakers supported CC with what has now become the new prevailing narrative among corporate “reformers”: the standards are good but could use a few tweaks, particularly around developmental inappropriateness; implementation has been problematic; and we need shorter and higher-quality tests. Interestingly, a lot of the CC supporters were highly critical of the Engage NY modules and other materials. In the face of the massive push back from opt out, they’ve clearly modified their stance to become a bit more critical. But most of the supporters were hired guns: Steve Sigmund, CEO of High Achievement NY; Evan Stone, co-CEO of Educators for Excellence and several E4E teachers; and Arva Rice, CEO of the NY Urban League. The only parents who testified besides me (you can read my testimony here) were two young parents who have just started to speak out about CC and high-stakes testing. They gave the most powerful testimony of the evening, by far! These two brave women were clearly motivated to come and speak because of the negative impact of CC and high-stakes testing on their children, but both also stated clearly that they felt compelled to speak out for all the parents who could not, and particularly for those who don’t know or understand what is happening to their children. They also acknowledged the language barriers that make it difficult for some parents to engage with these issues. 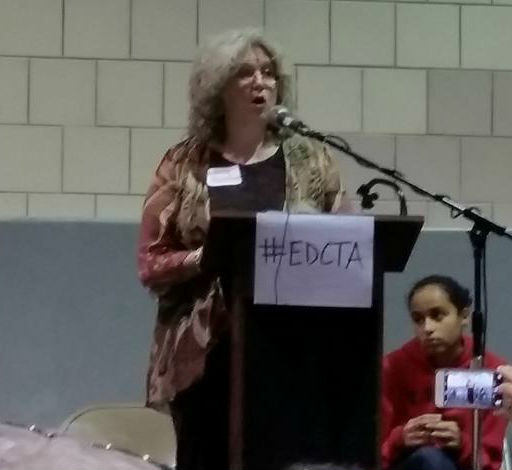 The rest of us who spoke out against CC and high-stakes testing have been speaking out on these issues for a while. But alas, none of us get paid to do so. On October 17, 2015 hundreds of parents, educators and students came together in New York City to imagine a new vision for public education. I had the pleasure of speaking on the opening panel along with Jamaal Bowman, Michael Flanagan and Beija, a NYC 8th grader. The panel was followed by an inspiring and fiery keynote by Yohuru Williams. Here is the prepared version of the remarks I delivered at the conference. I have been a NYC public school parent since 2002, the year No Child Left Behind (NCLB) went into effect. Both of my sons, who are now in high school, attended a traditional K-8 school in Washington Heights, which is in Manhattan’s District 6. So I watched No Child Left Behind, then later Race to the Top, unfold in one school over 13 years – and it was instructive. I didn’t pay too much attention in the early years of NCLB although I do remember reading opinion pieces in support of the law by a certain Diane Ravitch – thank goodness for all of us that she saw the light and eventually renounced the dark side! With each passing year, I watched as test prep increased. Student promotion was based on test scores until recently and so were the DOE’s school report cards. I saw a qualitative difference in the education received by my younger son, who is 4 years younger. Teachers started talking about the tests the first week of school; there were fewer projects and less homework in science and social studies; and test prep packets came home earlier and earlier in the year. And I saw a change in the teachers. Even before test scores were being used in teacher evaluations, I could sense the pressure and the fear that teachers felt – most of them hid it well, but it was palpable. And it began to rub off on the kids. My son felt the pressure to do well for his teachers and seemed to think the tests were a lot more important than I did. That’s when I began to educate myself about education policy – it was about 4 years ago. That’s also when I found Change the Stakes, a grassroots group of NYC parents and educators fighting high-stakes testing. One thing I appreciated about Change the Stakes is that the founding group understood the corporate education agenda in the context of racial, ethnic and economic disparities. It was a good fit for me because I was raised in a family where inequality was a frequent topic of conversation. In the 1950s, my dad, a native Georgian, was the pastor of a white church in a very small town south of Atlanta. In the wake of Brown vs Board of Education in 1954, my father preached a sermon against segregation and was almost removed as pastor. My husband, who is African American, is a native of South Carolina and attended a segregated elementary school – this was a full decade after Brown vs Board of Education. His family had crosses burned on their lawn. I came to education policy not only with a focus on racial and ethnic inequities, but also economic inequities. Professionally I’m a sociologist and I research and advocate for policies that reduce child and family poverty and that increase opportunity for children. I understand that to increase a child’s chances for success in life, we have to start early. By the time children enter kindergarten, white kids in economically secure families and with college-educated parents have already experienced a host of advantages compared to their peers whose families struggle financially: secure housing, plentiful meals, access to books and other educational materials, parents who talk to them incessantly, expanding their vocabularies. On average, they get more dedicated time from their parents who aren’t working 2-3 jobs or night shifts to make ends meet. The cumulative toll of these early disparities can be enormous. Yet the corporate education zealots – I refuse to call them reformers – tell us that to talk about such things is to make excuses. Excuses for failing teachers and failing schools. But the people in this room know that family income is the single greatest predictor of test scores! The people in this room know that poverty matters, racism matters, white privilege matters! All of these things affect what goes on in classrooms across the city every day. All of these things affect what school a child gets assigned to or gets into, what kind of resources the school has, how big the classes are. All of these things affect what kind of disciplinary practices a child is subjected to and how likely they are to get suspended or otherwise punished. But the corporate education zealots argue that poverty and race shouldn’t matter – that if all children were held to equally high expectations and had great teachers, then everything would be fine. By ignoring race and ignoring class, they deny very real differences in the day-to-day lives of students. I’m not arguing that race and class are destiny – they’re not. Children are resilient and capable of overcoming great hardship; we underestimate them to our peril – and theirs. To the degree that some teachers and some administrators do have lower expectations for children from low-income families or for children of color just because of their background or color of their skin, that’s wrong. All children need to be given the opportunity to be challenged, to live up to high expectations. But what the corporate education zealots refuse to acknowledge is that no matter what race, ethnicity, language or family income level, each and every child is different and has different needs. As parents, we need our children’s teachers to have the freedom and flexibility to meet them where they are – not where Bill Gates and his Common Core says they should be. As parents, we need our children’s teachers to have the professional autonomy to determine when and how our children are assessed – not to be forced to administer one-size-fits-all standardized tests, especially when they’re developmentally inappropriate. As parents, we need our children’s teachers to be evaluated holistically, not on test scores. To those of us who say that poverty and racism are the root causes of educational disparities, the corporate zealots respond that “we can’t fix poverty first; there’s no time; we’ve got a crisis; we have to move full speed ahead; we’ve got to jump into the deep end of the pool.” That’s their justification for imposing a giant, costly experiment on our nation’s public school children. That’s their justification for top-down ultimatums – “improve test scores or we’ll close your school or turn it over to the state.” That’s their justification for everything they do, without a shred of evidence that it will improve education or help kids. But whose schools are being closed or threatened with state takeover? It’s not suburban schools where the majority of kids are white and from middle- and upper-income families. It’s not urban schools where there’s a substantial minority of kids who are white and from moderate to high income families. The schools that are threatened with closure are urban, high-poverty schools where most of the students are children of color. In the process, they’ve now wasted well more than a decade on so-called reforms that have enriched private interests, while turning schools into test prep factories. By narrowing the curriculum, taking autonomy away from teachers and engaging in non-stop test prep, our schools are turning out students who in many ways may be less prepared for college than the previous generation. Ask any college professor. My husband has been teaching at the same college for nearly 20 years. He says students are much more afraid of taking risks, much more afraid of being wrong, much less intellectually curious and much less capable of independent and critical thought than students 10 years ago. So in the name of getting kids “career and college ready,” the zealots have likely lowered the quality of public education overall. At the same time, they have ruled out strategies that have been proven to improve academic performance among kids with the most disadvantages: increasing family income, providing high-quality comprehensive early childhood programs, reducing class size (especially in the lower grades) and integrating schools socioeconomically and racially/ethnically. So what’s my point? I started off telling you about my own kids and my personal experiences as a parent and then ended up talking about poverty, racism and white privilege. My point is that if we as parents want to change what is happening in our own children’s schools, we need to think close to home about what our own kids need, but we also need to think about other people’s children as well. We need to understand what is happening to our own kids in the larger context of a school system that, instead of being the great equalizer, is in fact a potent force for replicating racial/ethnic and socioeconomic disparities. We have to figure out how to make things better in the here and now, while also keeping the future in mind; we need to engage in both short- and long-term thinking. We have to play defense as well as offense. What does that mean concretely? Let me start with an easy example: we have to play defense as well as offense. In terms of defense, we have to keep doing what we’re doing by building the momentum around opting out of high-stakes testing: NYS obviously did a great job this past year with 220,000 opt outs statewide and that made a huge political statement – it got Albany’s attention; it got the attention of the feds as well. Opt out is a powerful political force, but it’s a heavier lift here in the city than in some other parts of the state. We tripled our numbers from last year; we need to continue organizing and getting into new districts and new schools. Many NYC parents still don’t know that they can opt out. But we also have to recognize that opt out is not every parent’s priority. Offense is important too. Many parent activists realize that we have to be able to articulate what we’re for, not just what we’re against. Here’s where I’d offer some friendly advice. Almost every time I’ve been part of a brainstorming session where a group of parents try to envision the education they want for their kids, the list ends up describing a particular class-based view of progressive education. There’s nothing wrong with that, but I think we’re better off recognizing that not all parents are looking for the same kind of education for their kids. That vision will likely be influenced by class, culture, ethnicity, race, etc. Why not strive for a vision that is more inclusive, that incorporates the most universal desires that parents have, including things that more privileged parents often take for granted – a safe school, a well-maintained facility, adequate supplies. Another example: corporate ed zealots have an overly simplistic, but nonetheless comprehensive narrative about what’s happening in our nation’s schools – they’re wrong, but they’ve got their narrative. What’s our narrative? How can we counter their explanations without coming across as if we’re saying everything is fine with our urban schools? It’s one thing to say the public school system as a whole is not failing, but what are our solutions for schools that are struggling? Here’s another opportunity for some big picture thinking. At least some of us need to focus on the problems caused by funding our schools with property taxes. How can we think creatively about how we assign students to schools without replicating patterns of residential segregation by race and class? There are already some folks in the city who’ve been working on such issues for a long time. But if we care about educational justice, we need to grow that effort. In closing, I’d just like to say that if ever there were a time for parents, educators and students to come together across class, racial and ethnic lines to save public education, now would be that time! And I know that most of you are here today because you’re interested in doing just that. Thank you all for leaning in and fighting for educational justice! In April, an estimated 209,000 students opted out of the New York State English Language Arts (ELA) exam, but in New York City, the numbers were quite small. I’m always surprised when reporters and others ask why NYC has a much lower test refusal rate than many other parts of the state. My first inclination is to ask why they would expect the city’s rate to be similar to the suburbs of Long Island or upstate. But then again, I’m a sociologist so I tend to view these things in terms of political dynamics – including the different geopolitics of urban, suburban and rural areas – as well as social class and race/ ethnicity. Viewed through these lenses, NYC’s opt out rate isn’t all that surprising. Let’s be clear: when so-called education “reformers” talk about “failing schools,” they’re not talking about the schools on suburban Long Island. They’re not talking about schools in the suburbs of NYC, Buffalo, Rochester, Syracuse and Albany. They’re talking about urban, high-poverty schools. So when public officials threaten to close or otherwise punish “failing” schools, they’re largely talking about schools in NYC and other large cities. Don’t forget that the state owes NYC more than $5 billion in school funds from the Campaign for Fiscal Equity settlement. Numerous superintendents, principals and even teachers warned parents that schools would be harmed or would lose funding if too many students opt out. In short, NYC schools, in addition to being perpetually underfunded, get threatened a lot, in a way that’s not true for suburban schools. NYC schools have been under mayoral control since 2002. We have no elected school boards as the rest of the state has. Those boards can sometimes be a central point of leverage for parents. NYC parents have nothing comparable. We have Community Education Councils (CECs) – elected parent bodies which essentially have no power except over zoning issues. For 10 years under Mayor Bloomberg, NYC children could not be promoted to the next grade unless they passed the state exams. Although the NYS legislature passed a law last year stating that state test scores could no longer be used as the sole or primary basis for promotion, that didn’t stop countless NYC principals from telling parents that their children would be sent to summer school or not be promoted if they didn’t take the state tests. Given that state test scores were the primary basis for promotion in NYC for 10 years, it should surprise no one that the way schools are now using test scores in the promotion process is widely inconsistent from school to school. Further, 4th grade scores are used by screened schools in the middle school admissions process in NYC and 7th grade scores are used by screened schools for high school admissions. This is another anomaly in NYC – most of the rest of the state does not have admissions processes for middle and high school. 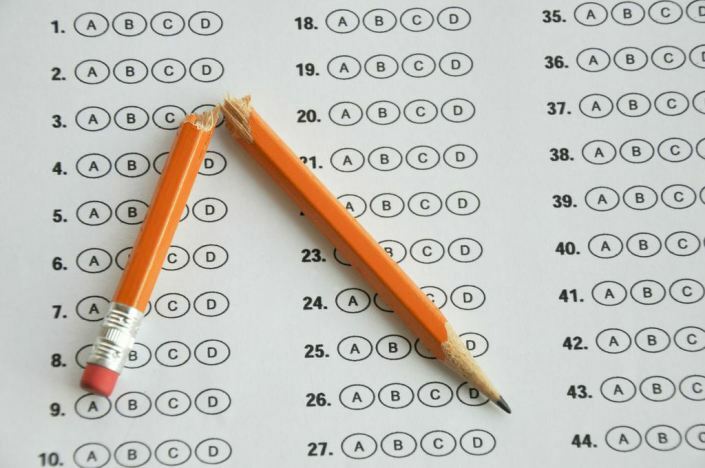 In some parts of NY State, including Long Island, teachers and administrators have felt free to express their concerns about the state tests. Educators have expressed many of the same concerns voiced by parents: some of the tests are developmentally inappropriate for children, particularly those in the younger grades, those with special needs and English Language Learners. In terms of the big picture, the use of test scores for teacher evaluation and other high-stakes purposes distorts the education process and has led to a narrowing of the curriculum. In NYC, where resources are scarce, families have seen music, art, physical education and even science disappear. Whatever criticisms educators might have of high-stakes testing in NYC, the leadership of the United Federation of Teachers (UFT), which is the largest local of NYSUT, the state teachers union, has made it absolutely clear that they do not support opt out and will not protect any teacher saying anything that could be construed as promoting opt out among parents. In contrast, NYSUT locals in some areas, particularly Long Island, have been in the forefront of promoting opt out. When so-called education “reformers” talk about “failing schools,” they’re gunning for NYC schools and schools in other urban areas. Under Mayor Bloomberg, mayoral control was used to produce a culture of fear throughout the education system – it affected administrators, teachers, parents and students. And it has not gone away. For 10 years, promotion in NYC was based on the tests. Many schools have not yet adapted to the state legislation stating that the tests can no longer be used as the sole or primary basis for promotion. Principals routinely used threats of summer school and holding kids back to discourage parents from opting out. Some parents, particularly those in Title I schools, were incorrectly told their schools would lose funding if students opted out. Further, 4th grade scores are used by many screened schools in the middle school admissions process in NYC and 7th grade scores are used by screened schools for high school admissions. Most NYC parents don’t even know that refusing the tests is an option. Many of those who do know are too scared to do so.